Mohamed Eljarh‏@Eljarh · 13 min. Officially, in an address to the LNA forces in and around Tripoli from the LNA's main Operations Room. Haftar declares the start of Operation Tripoli. Last edited by goldenequity; 04-05-2019 at 04:54 AM. (so Haftar is really a Saudi collaborator now? but recent reports say he has had secret meetings with the Saudis and Mossad. Last edited by goldenequity; 04-05-2019 at 07:10 AM. libyaherald‏ @libyaherald · 33 min. Last edited by goldenequity; 04-05-2019 at 06:50 PM. Libya a great success story for NATO. BREAKING: LNA Air Force declares western Libya as military operations area where no warplane or aircraft will be flown. "Any aircraft in this area will be dealt with as a hostile target & the airport which took it off from it will be immediately hit." LNAAF said. Egyptian-backed Libyan National Army (LNA) prepare to square off in the capital city of Tripoli. the Islamic State (ISIS/ISIL/IS/Daesh) and Al-Qaeda, along with the Turkish-backed Government of General Accords. 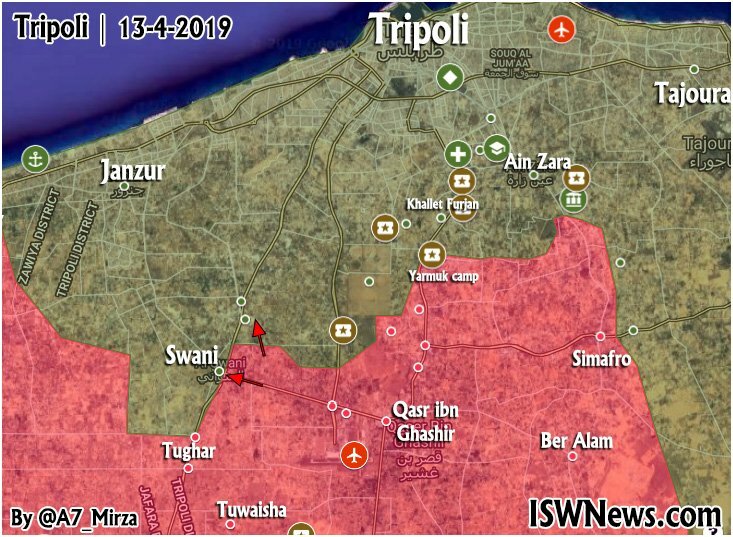 With the recent capture Gariyan in northwestern Libya, the Haftar-led forces have besieged the Government of General Accords south of Tripoli city. 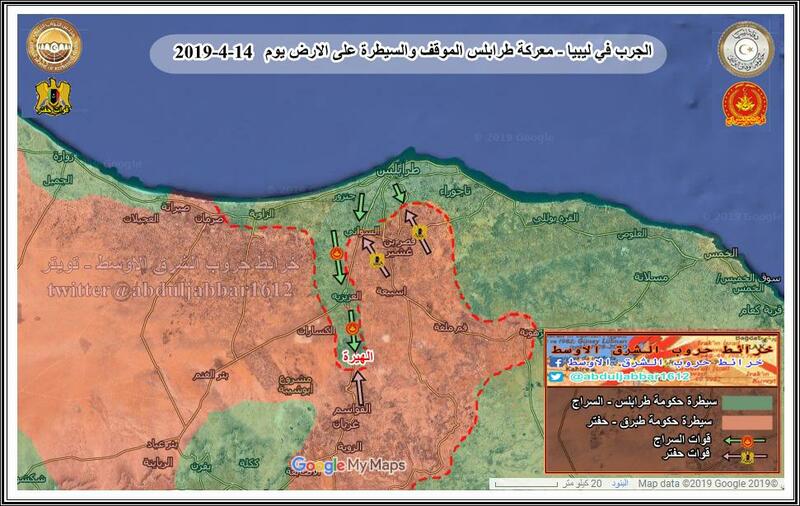 Furthermore, the Haftar-led Libyan National Army is now within striking distance of Tripoli for the first time since the second phase of the Libyan War began. who have already sent much needed military aid to the forces in Tripoli. they could ultimately force the Libyan National Army to halt their operations around the capital. especially given that the Libyan National Army is already at the outskirts of the capital city. but it is unlikely that he was able to persuade the Libyan general to abort his military initiate. Kadhafi’s son, Seïf al-Islam Kadhafi is dead. Last edited by goldenequity; 04-06-2019 at 03:17 PM. Youtube video already blocked. The evil must not like Haftar. Blocked on copyright grounds. Yeah right. The US army evacuated the US diplomatic mission stationed in Tripoli. Sarraj with his generals. Still, without Misrata's help, he will lose Tripoli. SouthFront‏ @southfronteng · 12 min. Last edited by goldenequity; 04-08-2019 at 04:12 AM. If Hafter wants to succeed he will have to take the road between Tripoli and Misrata to split his enemies. He could then take Tripoli and announce his own national government. There are rumors that some of the warlords in Tripoli are willing to change sides and to join Haftar. Hafter has open support from France, the UAE, Saudi Arabia, Egypt and Russia. The Trump administration is not interested to step into the mess. Hafter is an old CIA asset and if he takes control there is a good chance that the U.S. will have influence over him. As long as Libyan oil flows and keeps the global oil price down Trump will be happy. Russia is trying to stay in the background to not give the anti-Russian forces in Washington an excuse to intervene. The Muslim Brothers, supported by Turkey and Qatar, are still in play in Misrata but have otherwise lost their influence on the ground. Hafter and his troops seem to have nearly all advantages on their side. 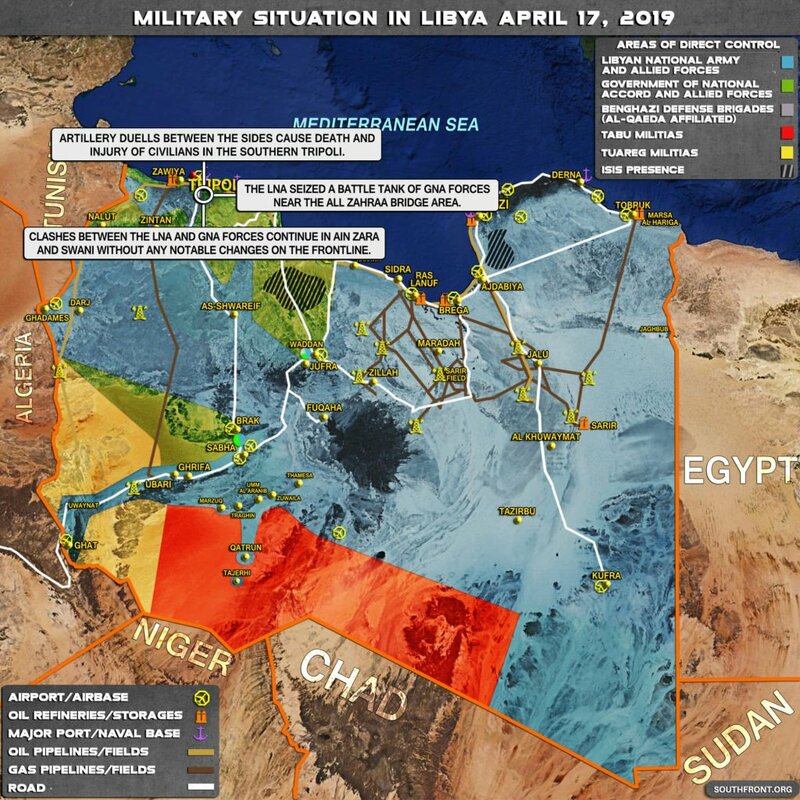 Their supply route from Benghazi through the south towards Tripoli is too long, but France is helping to protect it by keeping rebels from Chad and Mali in Libya's south under control. The Egyptian air force may well help again and destroy whatever planes Misrata has left. But war is unpredictable and militia in Libya have often changed sides on a moment's notice. It may take 10 days to take Tripoli without many casualties or 100 days of intense fighting. The attempt could even fail. Libya is a divers tribal country that is unlikely to function as a democracy. A strongman like Muhammad Ghaddafi can control it by distributing the income from its mineral resources and by keeping the Islamists down. Hafter may be able to replicate that. But he is 75 years old. A year ago he was evacuated to France for some medical emergency procedures. His sons, two of which lead some of his militia, are of unknown quality. Another problem is brewing in Benghazi where Wahabbi preachers, trained in Saudi Arabia, replaced Muslim Bortherhood preachers and now introduce Saudi style rule over women and local culture. A strongman ruling all of Libya from Tripoli is certainly better for Libya and its people than the long chaos that ensued after the war the U.S., Britain and France waged against the country. Given some time Hafter may well achieve that. But he is not a longterm solution. The best one can hope for is that he wins enough time for Libya to come back to its senses and for the civil war to die down. This is what diversity does to a country, it's no wonder the Demoncrats want it here. Pretty much you nailed it Sword and Diversity is what destroyed Yugoslavia. Here's the taste of Diversity. They argued that the capital is predominantly Muslim and Father Christmas is not part of the Muslim tradition. Do ya think Western Liberals would ever wake up? Most will never wake up, they will die first. But enough might wake up to save the west at the last moment. Oded Berkowitz‏ @Oded121351 · 5 min. Last edited by goldenequity; 04-11-2019 at 03:48 AM. Today Turks form two-thirds (est.266,640) of Misrata's 400,000 inhabitants. Last edited by goldenequity; 04-15-2019 at 03:31 AM. Ya well good luck with Tripoli , LOL , what a fools errand . Last edited by goldenequity; 04-19-2019 at 06:06 PM.